I’m Paying For a Personal Chef, Not a Wife! My roommate “Plaid” and I recently entered into an agreement, and consequently a new stage of our friendship. Which have subsequently received the response of “Sarah, I am paying for a Personal Chef, not a damn Wife”. Fair point, fair point. I just don’t want food to be wasted, served cold, or microwaved into shoe leather. Which was a definite concern for last night’s pork chop dinner. I ate it hot from the oven, Plaid ate it at his desk today. But I was assured that it still tasted far better than Chipotle. Praise the Lord. I stumbled across this recipe when searching for something different to do with a cauliflower. I usually make a delicious Cauliflower Cheese dish (note to self, must blog this recipe) but wanted to mix it up a little. Behold a decadent Parmesan Cauliflower Puree. This was served as an accompaniment to Balsamic Maple Pork Chops with Sauteed Garlic Spinach. I pretty much followed the Schmidt Bros recipe, apart from a few measurement adjustments, leaving out the truffle salt (not a fan!) and switching the brussel sprouts for spinach. I really enjoyed this dish as it was a totally different spin on pork chops and cauliflower, but still simple and easy enough to make on a weeknight. Place all ingredients minus the butter in a pan over a medium heat and whisk. Cook until simmering for about 5 minutes. It should thicken slightly. Take off the heat and stir in the butter. Season your pork chops and cook however you would like. I pan-seared mine, but the grill would work best if you have one. Cook to your liking, then smothered in the balsamic glaze and either put back on the grill or place in an oven at about 425 degrees F for 10-15 minutes until sizzling! If you have any glaze left, drizzle it over the top of the pork chops just before serving. Place in a food processor with butter, cream, Parmesan and seasoning. Blend until cauliflower resembles mashed potato. Drizzle olive oil in a frying pan over a medium heat. Add spinach, garlic and seasoning to the pan and stir until spinach has wilted and garlic is fragrant – about 5 minutes. 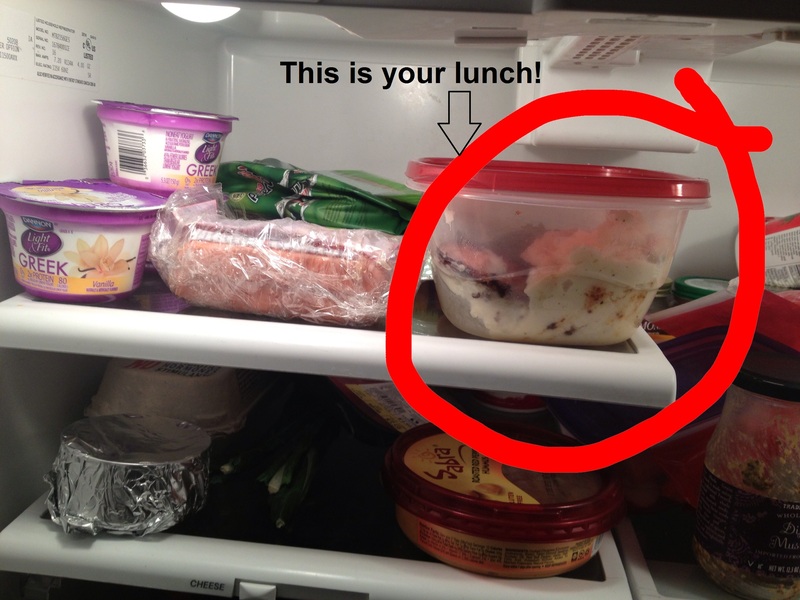 Pop on your plate (or in a Tupperware!) and devour. 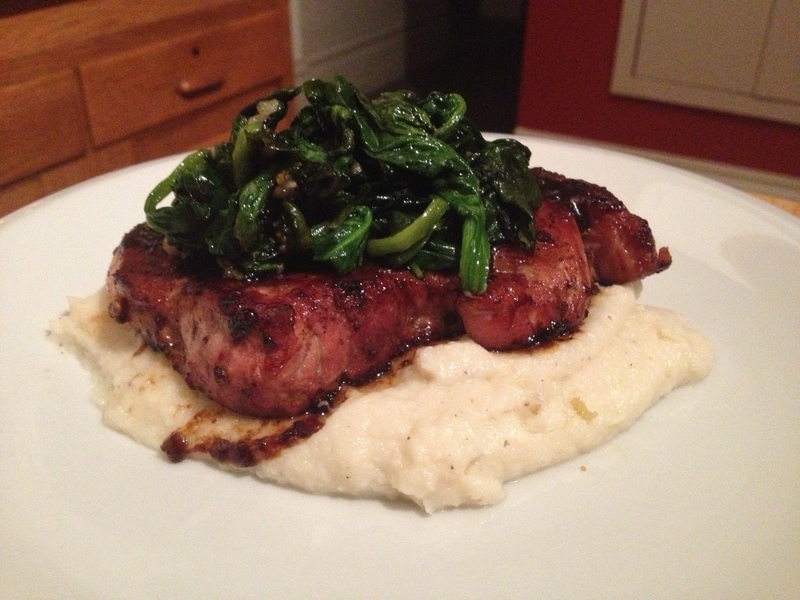 I enjoyed my pork with a bottle of Cellars 33 2010 Pinot Noir – it was a delicious pairing! Now I just need to remember that I am only the Personal Chef, not the Wife – do you think sending Plaid pictures like this sends the right message? !